Nothing compares to the magic of creamy, delicious ice cream. But on the low-FODMAP diet those frozen treats are not the safest bet. Though options exist to limit lactose, they aren’t all low-FODMAP…and if they are, how do they taste? I decided to test for myself. I shopped around, read a ton of labels and found some low-FODMAP options. 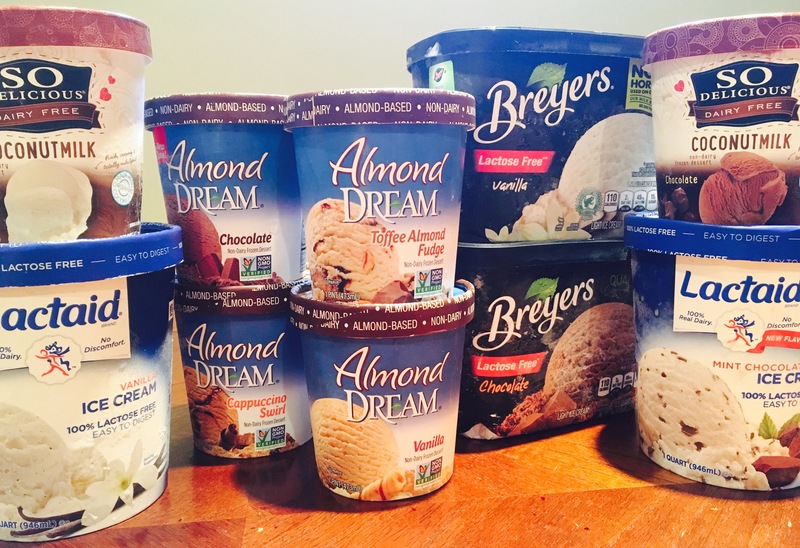 Here is my low-FODMAP ice cream taste test! Also…Check out over 200 low FODMAP recipes right here on the blog. You may love my low-FODMAP desserts and treats collection for some recipes for your own low-FODMAP popsicles and ice creams. The judges ranked the choices on taste, texture and overall. For the low-FODMAP challenge, we selected those with almond milk, coconut milk, and lactose-free dairy. Beware, however, many options that appear to be low-lactose have high-FODMAP ingredients. Read labels. Also, please note that none have been formally tested for FODMAPs. Also, maltodextrin is listed on many labels, as well as carrageenan. Not necessarily high-FODMAP, but these could upset stomachs and trigger inflammation. So take it slow, avoid these additives, or (what I’m considering) buy an ice-cream maker for home! Note: I did get an ice cream maker! Check out my recipes for low-FODMAP dark chocolate ice cream and low-FODMAP french vanilla ice cream! 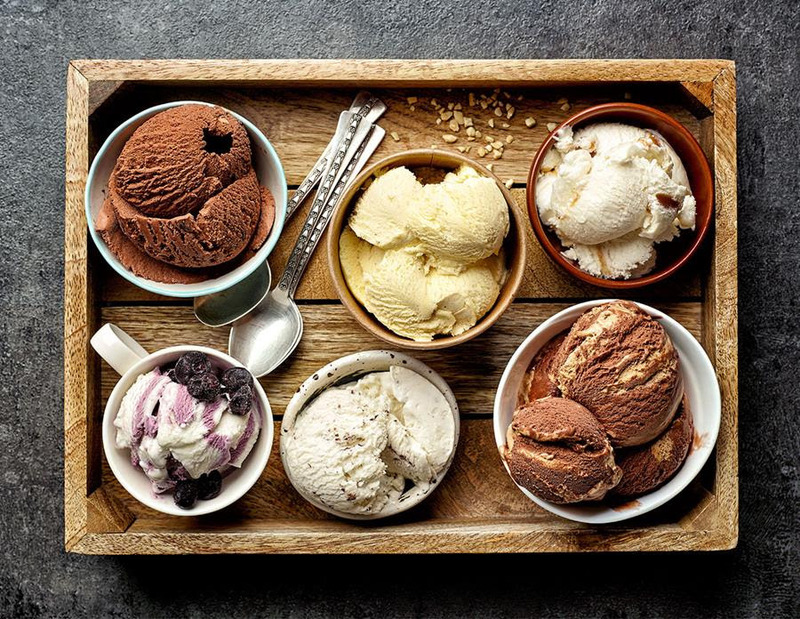 And here are the results…what is the best low-FODMAP ice cream you ask? This led to difficulty scooping and a harder, grittier texture. Both of these scored 9.5 out of 10 in all categories. They tasted exactly like regular ice creams, melted right and were smooth in texture. Scored 9/10 on all categories, great having the little chocolate pieces, if this is a flavor you prefer. 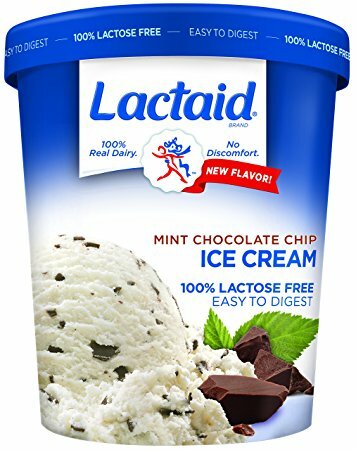 Lactaid Vanilla: average 8.5/10. Could have more vanilla flavor. The texture was better than the non-dairy contestants but not as smooth as Breyer’s. 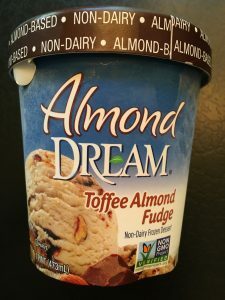 Almond Dream Toffee Almond Fudge– this scored 7/10 on all parameters. Great bits of almond, but the ice cream didn’t melt on the tongue right and had a strange aftertaste. Still, heads above all the other dairy free options. Almond Dream Cappuccino Swirl: average 5.5/10. Not enough coffee taste, strange texture. Nice fudge ripples made it passable. Almond Dream Chocolate: average 5/10. Definitely not chocolatey enough. Almond Dream Vanilla: average 4/10. So Delish Coconutmilk Chocolate: average 4/10. Dark and seems rich but coconut aftertaste and poor texture. Got mixed reviews- some preferred the coconut flavor but most scores indicated this to be the lowest chocolate ranked. So Delish Coconutmilk Vanilla: average 3/10. Virtually no vanilla notes. Very lackluster. So there it is! 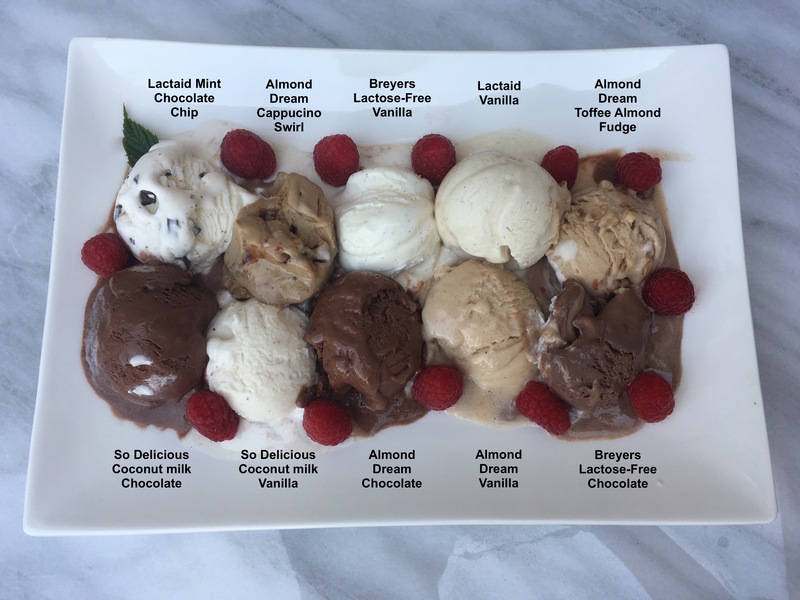 The results of our low-FODMAP ice cream taste test! Of course- you should make your own decisions. Ice cream is one of those things that even when its bad, it’s still really good. Check out my blog for more great low-FODMAP tips, including my low-FODMAP Flour Bake Off and low-FODMAP Fast Food Lists.